Take a scenic side trip into the Sapphire Mountain Range and visit the picturesque tumbling waters of Skalkaho Falls, located approximately 25 miles east of Hamilton. See the breathtaking, cascading waters of Skalkaho Falls. Located along Skalkaho Highway (MT-38), within the Sapphire Mountain Range and Bitterroot National Forest. Spot elk, deer, moose and other wildlife. Camp, hike, and picnic near the falls. From US-93, head east on MT-38. Skalkaho Falls is located in the Sapphire Mountains within Bitterroot National Forest. 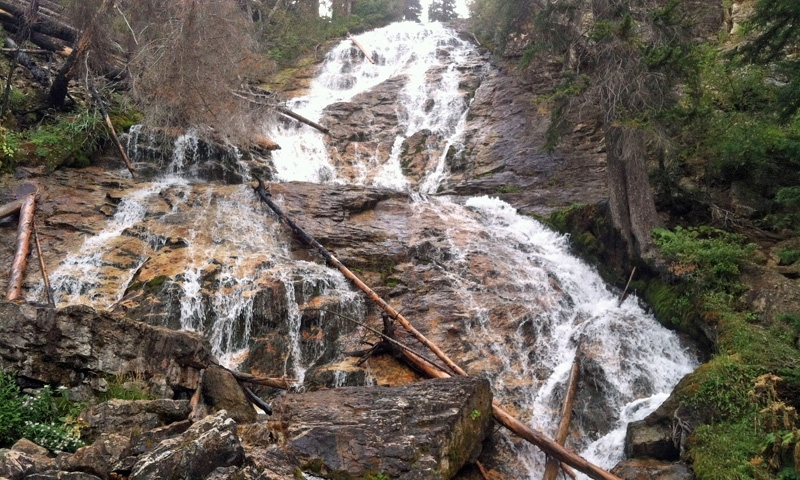 The water of Skalkaho Creek cascades down over 150 feet, providing impressive views and great photo opportunities. Most accessible during late spring through early autumn, the falls can be quite a busy tourist destination despite its remote location. Picnic here and then continue down the Skalkaho Highway, keeping your eyes open for passing wildlife. Other area activities include camping and hiking. Skalkaho Falls is located along Skalkaho Highway (MT-38), in between Hamilton and Phillipsburg. 3 miles south of Hamilton, turn left on MT-38 E/Skalkaho Highway and continue another 22 miles. The falls will be located on your left. Travel on Skalkaho Highway is slow due to narrow curves and limited pull-outs. During winter, only the first 10 miles of the road is plowed for automobiles but is accessible to snowmobiles beyond that point. Travel through dense forests, grassy meadows, and steep passes on your way to the falls. During spring, summer and fall, continue your journey all the way to Phillipsburg for your chance to see large herds of elk in the basins during dawn and dusk hours. Mule deer, moose, and black bears can also be spotted from the highway as well as a variety of birds during summer. Two campgrounds are located along MT-38. Black Bear Campground features six camping sites and is located adjacent to Skalkaho Creek. Crystal Creek Campground is located near Mud Lake and feature 3 campsites. There are no fees to stay at either site. Plenty of hiking trails are located in this area of Bitterroot National Forest. Just one mile east of Skalkaho Pass is the access for Mud Lake hiking trail. For a more rigorous hike, trek the ridge of Skalkaho Basin or climb Domed Shaped Mountain.